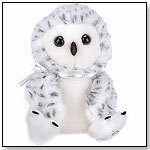 The White Snowy Owl is a cute and precious addition to Russ Berrie's Shining Stars lineup of collectible plush dolls. When kids purchase a Shining Stars friend, they can log onto the Shining Stars website and use the secret code inside the plush’s hangtag to register and name a star with the International Star Registry. Children can print a star certificate that gives the exact location of the star. 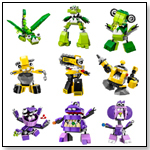 The site also offers fun games and activities. ― When the Webkinz crunch hit and retailers were left Cheeky-Dog-less for Easter, savvy store-owners picked up the slack by turning their little Webkinz fanatics into Shining Stars lovers. Steady sales since have earned Shining Stars a TDmonthly Top Seller 2007 award. — Three Sisters sold 400 Shining Stars dolls between April and July of 2007. The toys also did well during Easter 2007 for The Treasured Child in La Grange, Ky. Other retailers have reported more lukewarm sales. — "Unlike some other Web-play plush, only Shining Stars comes with a secret code that opens up a world of Web adventure, allows collectors to get their very own star in the constellation of their choice, and helps the Starlight Starbright Children's Foundation through the donation of 'glow points,'" said Stephanie Araujo, marketing coordinator for Russ Berrie.